I gotta be honest, I'm getting kinda tired of these minor prophets. They're sorta like the previews you see before movies. One or two are OK, but twelve? My soda was gone by Obadiah, my popcorn was gone by Micah and I already took a bathroom break during Habakkuk. I just want to get to the main feature, you know? Zephaniah, in his book, talks about judgement on Judah, judgement on Israel's enemies and then judgement on Jerusalem. I feel like I've heard this before. Most of the biblical imagery I've seen that has to do with illustrating music or singing usually involves harps or lyres (aren't they the same thing?). 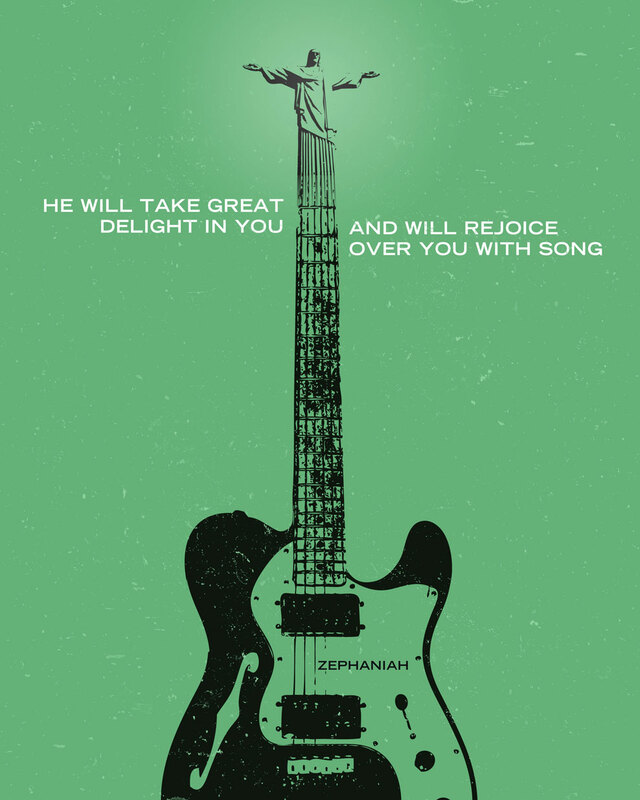 I'd like to think that if Jesus came back today, he'd sling up a six string and rock out. As I was putting this week's design together, it was hard for me to settle on what type of axe to use... so I used three. In addition to the Telecaster above, you can check out the acoustic and an old school heavy metal Jackson.